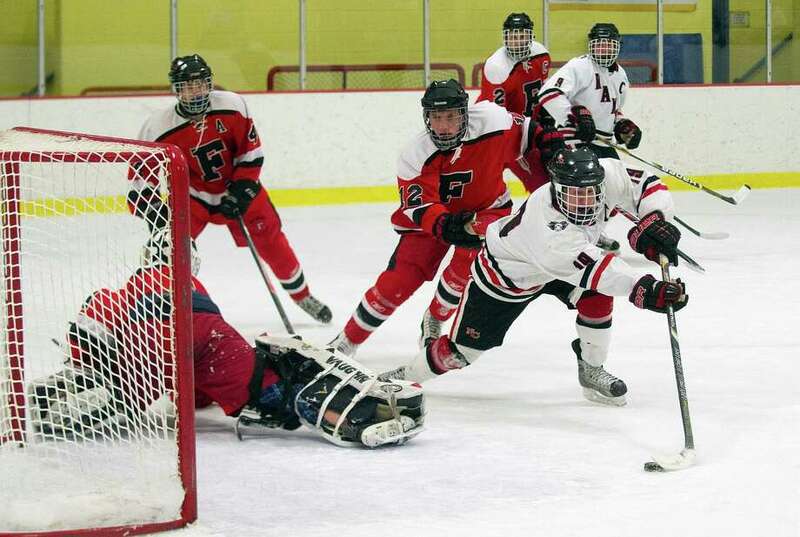 New Canaan's Henry Stanton scores a goal during Friday's FCIAC quarterfinals against Fairfield at Terry Conners Rink in Stamford, Conn., on February 28, 2014. STAMFORD — One would be safe to assume that playing four games in one week should drain a hockey team by the time its fourth puck-drop rolled around. Yet, in regards to the New Canaan boys, you would be wrong. No. 3 New Canaan rolled No. 6 Fairfield 7-0 Friday at Terry Conners Ice Rink in the first FCIAC quarterfinal game of the night. The victory was the Rams fourth win in as many games over the last seven days, including a previous 7-2 triumph over the Mustangs (7-14) on Sunday. The win advances New Canaan (16-4) to Wednesday’s semifinals, where the Rams will face No. 2 Ridgefield, a 4-1 winner over St. Joseph later Friday. The Rams put the game away in the first period, notching a pair of goals in the first six minutes and another two in the final 61 seconds. Parker Lewis and Patrick Hompe finished the game with two goals apiece, while Harry Stanton collected three points. Scoring six seconds later than their opening goal against Chesire Monday, the Rams struck first at nine ticks in on a Hompe goal assisted by Stanton and Peter Katz. Stanton slid the puck across the low slot at the end of a two-on-one opportunity, which Hompe easily converted. The junior forward returned the favor at under 40 seconds remaining in the frame, following a hooking call against Fairfield’s Austin Armas. Five seconds into his team’s new power play, Hompe fired the puck over to his Stanton, who lit the lamp and pushed New Canaan’s lead to 5-0. The teams traded penalties to open the second frame, one marked from start to finish by increased physicality. Katz finally tacked on another Rams goal midway through the period, moments after his team had killed a Cooper Manchuk penalty. Armas responded immediately with his third and fourth infractions of the game, a five-minute check from behind penalty and a 10-minute misconduct. Nevertheless, the Mustangs held off the Rams for the entirety of the prolonged power play and began racking up their own shots at the other end. New Canaan’s final goal came four minutes into the final frame, when Hompe avoided two attempted hits against the boards and deftly flipped the puck backhanded for a score. Rams goaltender Mac Wright recorded 10 of his 14 total saves in the third period, as Fairfield switched to back-up goalie Kyle Greenhut.